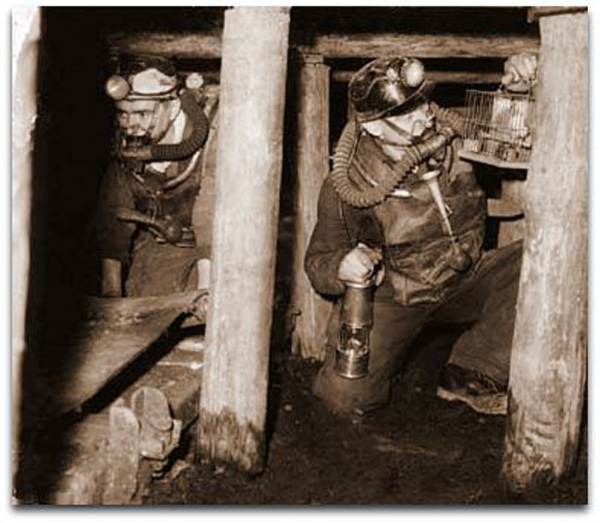 WITH the construction of a "hot and humid" chamber, all the conditions likely to be encountered in a colliery accident can now be simulated for training purposes at Ilkeston Mine Rescue Station. The station is the only one in the country to have a chamber of this size and the ideas it incorporates are being circulated to other areas. Rescue teams training at the station can experience the conditions they would meet when working in a mine where an underground fire was raging. They can become accustomed to the strength-sapping humidity which accompanies such a fire. 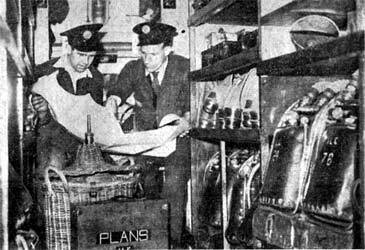 Called to a colliery, Mr. Eric Minard and Station Officer Harry Newton examine, in the van, a plan of the pit. The chamber is fitted with a length of roadway 5ft. 6ins. wide and 7ft. 6ins. high and while training in the chamber the rescue team work at sealing it off with 200 sandbags. "There would be little point in having them standing still," Mr. A. Syson, superintendent, told me. "In an accident they would have to work hard in the humid atmosphere." The trainees can be watched at work through a plate glass window. Eric Minard who has charge of 40 canaries returns one to it's cage. "By using it we can test the men for their tolerance to the conditions," he continued. "We divide them into three categories highly tolerant, heat tolerant and heat intolerant. This is most useful because of the danger of a man collapsing and hampering rescue work. 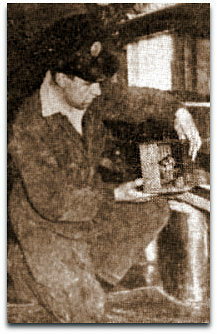 "Under the rescue station a miniature colliery has been constructed. Although it runs only a few' feet under the surface it has the appearance of a normal coal mine." 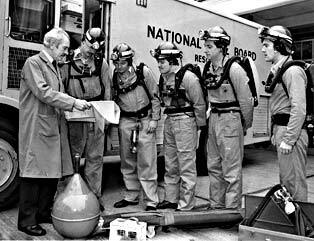 When I visited the station a rescue team practised fighting an underground fire. Working in dense smoke they quickly erected diversion middle-set sheets which cleared the smoke like magic, They then set about sealing off the fire. There are 12 men employed at the rescue station, including Mr. Syson. Working on mine rescue is a young man's job and members of the permanent staff have to retire at 45. The assistant superintendent continues to 55 and the superintendent to 65. When the men retire, attempts are made to employ them as fire officers at collieries, so that their special training is not wasted. Rescue teams from nearby collieries use the station for training. Ilkeston Rescue Station covers collieries in Nos. 5 and 6 Areas. All the mines are inside a ten mile radius of the station and in the event of an emergency, rescue workers can reach any point within 30 minutes of the alarm being given. Underground in the training gallery at Ilkeston Mines Rescue Station. On the conveyor belt, left, Philip Healey. Tom Rainbird has the lamp and canary.